I am always excited when May rolls around to celebrate my absolute most favorite activity, SCRAPBOOKING! And every year, Close To My Heart brings us a special line of goodies just for National Scrapbooking Month! This year CTMH is offering an exclusive set of Cut Above™ scrapbooking layouts during May only. Our Cut Above layouts kits truly make scrapbooking faster, simpler, and easier! 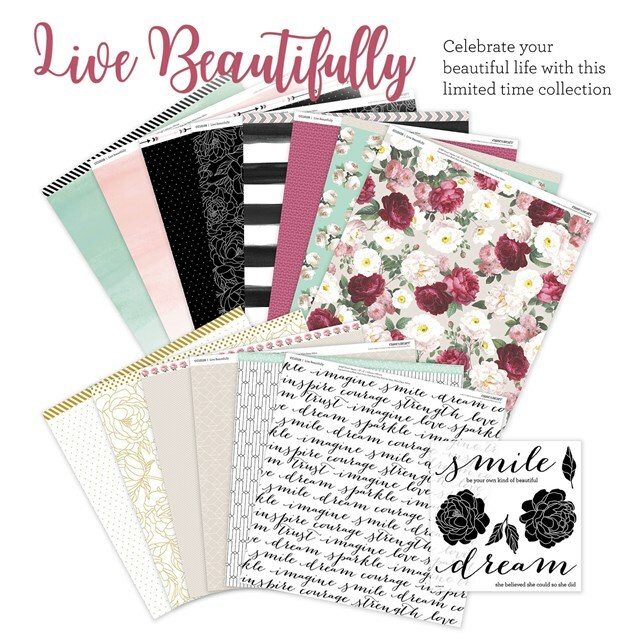 During May, we are offering exclusive products to celebrate National Scrapbooking Month: the Cut Above Live Beautifully layout kit, the Live Beautifully album bundle, and the Live Beautifully paper packet and stamp set. The Cut Above Live Beautifully layout kit includes supplies to create five 2-page layouts along with six Memory Protectors™, the BEST page protectors on the market! If you think that sounds good, you will like the exclusive Live Beautifully album bundle even more! In addition to the Cut Above layout kit, it also includes a journaling pen, adhesive, and our My Legacy™ post-bound or D-ring album. Best of all, the bundle is available at 20% off! To make this months Live Beautifully line stretch even farther, CTMH created a SECOND three 2-page layout workshop, a Mini Album workshop AND a greeting card workshop! This paper line is so beautiful, and I love that there are so many ways to use it! The gold foil accents are just stunning! The exclusive Live Beautifully items are available this month only, while supplies last. To view the kits in detail, or for more information on ordering, visit my website HERE! And as always, be sure to join my VIP Facebook group to stay most current on my personal specials and events!